Van Leeuwen Pipe and Tube Group is a worldwide specialist in steel pipes, and pipe and tube applications. We are active in virtually all industrial sectors. With 50 branches spread throughout Europe, the Middle East, Asia, Australia, and North America, we ensure that materials are available anywhere in the world and customised to meet specific regulations. Our employees have specialist knowledge of sourcing, project management, logistics and stock planning and work closely with our customers in the industry and energy markets. The combination of global logistics and knowledge of products and customer applications makes Van Leeuwen a leading company in its field. For engineering companies, constructors, main and sub contractors and end-users of power plants and related equipment, Van Leeuwen offers a package of steel piping products, components and services with a primary focus on low / medium pressure, balance-of-plant, as well as structural applications for fossil fuels and renewable energy generation. From our extensive worldwide stocks and the interconnected network of high quality manufacturers, we are able to supply steel piping products for many applications in thermal power plants and alternative modes of power generation. In addition, we offer customised services aiming to reduce the total cost of ownership in the production chain, supporting the competitiveness of our customers in their markets. Van Leeuwen provides an extensive range of ASTM/ASME and EN products in assorted materials, grades and sizes. From our many years of experience, we have a clear understanding of the specific requirements of almost every piping system. Our extensive delivery programme comprises the feed water system up to the main steam piping for the boiler tubing in thermal power plants, as well as the full range of piping applications for renewable energy generation. As well as the standard sizes for pipes, fittings, flanges and valves, Van Leeuwen delivers customised solutions through forging, machining and spooling (Y-pieces, headers, bending, welding). Using high stocks of forged bars and semi finished products, Van Leeuwen can offer short delivery time solutions for turnarounds and emergencies. Our experts have a wealth of technical knowledge and can assist you in determining the specifications and availability of piping materials you need for specific purposes, enabling you to make the right choice. The greater the efficiency of power stations results in less pollution and higher profits, which is a process that demands a high standard for materials. With our global network of leading manufacturers and high-performance laboratories, we are continuously increasing our standards of quality and searching for new materials to meet the demands. As a consultant between owner and manufacturer, we are permanently focusing on finding the right solutions, always on time to serve the demand. Through our offices around the world, we can competitively source and supply virtually any piping and accessory product to provide you with a complete piping package, offering valuable time saving. At our premises in Europe, the Middle East, Asia, Australia and Canada, we have approximately 100,000t of materials readily available, with continuous modernisation of our facilities resulting in enhanced customer service. Next to this, we offer the option to temporarily stock your project specific materials in one of our yards. Product quality is of the utmost importance in the power generation industry. Our global sourcing network maintains well-established relationships with leading manufacturers and distributing partners. Suppliers are carefully selected and audited. They are only allowed on our approved manufacturer’s list if they meet all our stringent quality requirements. In addition, Van Leeuwen keeps track of the latest developments regarding steel quality. Modern software and digital services support our quality awareness. Van Leeuwen is ISO 9001-2000 certified and fully committed to assuring and maintaining a safe working environment for our employees, sub-contractors and visitors. 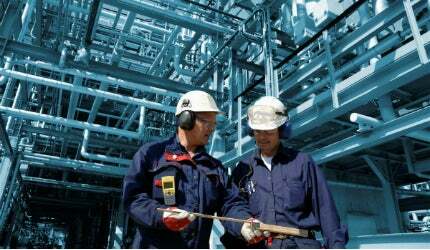 We implement a health and safety system in accordance with the OHSAS 18001 requirements. EN. For seamless pipes in P195GH, P235GH, P265GH, P280GH, P355NH, 16Mo3, X11CrMo5, X11CrMo9-1, 10CrMo5-5, 13CrMo4-5, 10CrMo9-10 and X10CrMoVNb9-1 and the related specifications for welded pipes, fittings, flanges, forgings, bar products, valves and accessories. As a company, you may have the best products and the broadest range of services based on the most extensive international network, and have the most qualified people. However, without teamwork - amongst colleagues, with suppliers, for and with customers - nothing will come of it all. Van Leeuwen have released a white paper detailing their stock programme for the power industry.